During the July video conference the Board adapted the ENFSI Action Plan 2017 – 2018 in order to send it to the Membership for final voting. The Board is pleased to welcome the KhRIFS Ukraine as 68th member of ENFSI. Further applications were discussed as well as administrational issues of the association. portfolios of the new Board Members. The Board Meeting prior the Annual Meeting was focused on the organization of this annual event. Some changes to the agenda had to be discussed and schedules amended. Chanda Lowther-Harris was appointed as the incoming chair for the QCC. Further the applications for Board Membership and the venues for the Annual Meetings in 2018 and 2019 were reviewed. 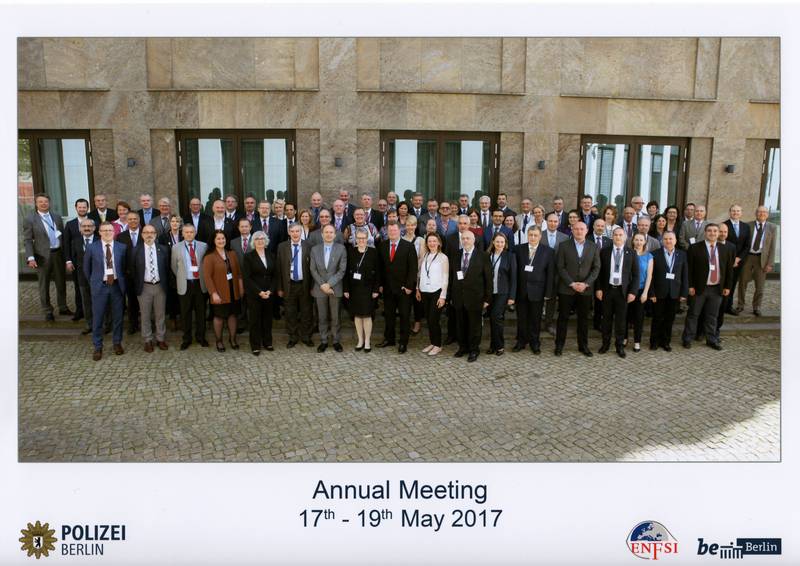 Held on 17-19 May 2017 in Berlin, Germany, the event focused on the future of ENFSI and its strategies. 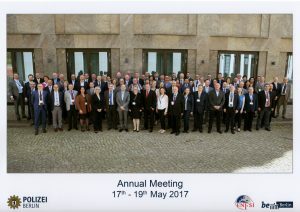 This year’s Annual Meeting was held in Berlin, Germany hosted by our member institute the State Criminal Police Office Berlin, Forensic Science. With the support of the director Ralf Heilman, Kornelia Nehse and her colleagues organized amazing meeting conditions and an exciting cultural program. On 17th May 2017 ENFSI started with the Thematic Day with the topic “Societal Challenges for Forensics”. Important topics such as immigration and border control, the growing importance of video surveillance and biometrics were discussed. The Business Meeting was held on 18th and 19th May 2017 and 57 member institutes were represented. Highlights of the meeting were the setting of new ENFSI strategies (Strategic Plan 2017-2020), the election of a new Chairperson designate and a regular Board member and with it the discharge of the former Chairman Jan De Kinder and the Board members Dominique Saint-Dizier and Ondrej Laciak. They significantly paved the way for ENFSI and the 21th Board which is now supported by the new Chairperson designate Gabriele Juodkaite-Granskiene and Dorijan Kerzan as regular Board member. The new Chairman Erkki Sippola is looking toward ENFSI’s future with a lot of confidence although forensic sciences will have to face hard challenges in order to fulfill the growing demand. The video conference prior to the Annual Meeting in May was focused on the preparation of this important meeting. Several reports which will be presented to the membership were reviewed, the agenda finalized and organization issues talked about. Preparing the Annual Meeting 2017 and defining ENFSI's future role by working on a new draft Strategic Plan 2017-2020. 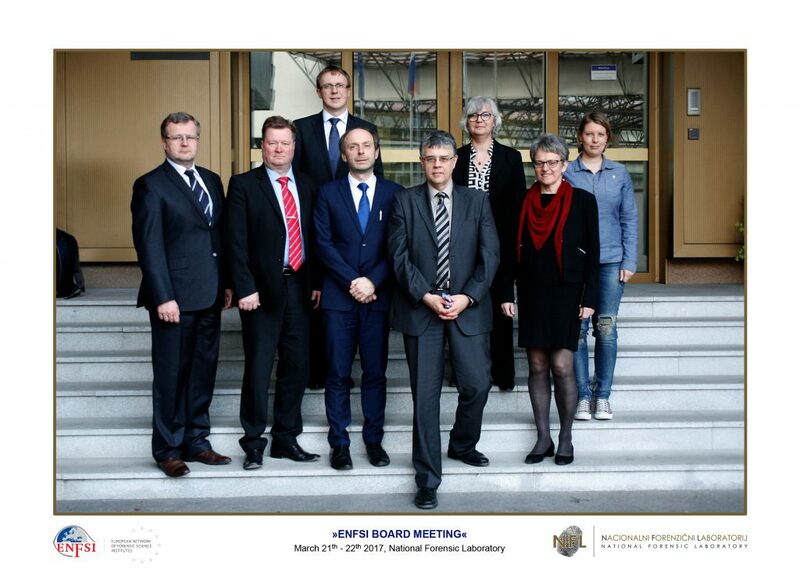 On 21-22 March 2017 an ENFSI Board Meeting took place in Ljubljana/Slovenia. The meeting was organized by Dorijan Kerzan, Director of our Slovenian member institute (National Forensic Laboratory). Most important topic was the preparation of the upcoming ENFSI Annual Meeting in Berlin, especially regarding the planning of the Thematic Day as well as further discussions on the draft ENFSI Strategic Plan 2017-2020 which will be an essential agenda point at the Business Meeting. The video conference was focused on the ENFSI Strategic Plan 2017-2020, which has to be approved by the membership at the Annual Meeting in May. The possible outline was discussed and further ideas collected for a final draft to be completed during the next Board Meeting. New article in "Science & Technology" published by Pan European Networks. In its 22nd issue of “Science & Technology” Pan European Networks interviewed our Chairman Jan De Kinder. Title of the article is “Analyzing Forensics” which highlights the importance of information sharing, training and cross-border collaboration. Link to official homepage of the event available now! finally the homepage for the Annual Meeting 2017 is ready and online! The site is restricted and the login-datas have been sent to the ENFSI member representatives by email. After the login you can take your time to register and discover all information available.